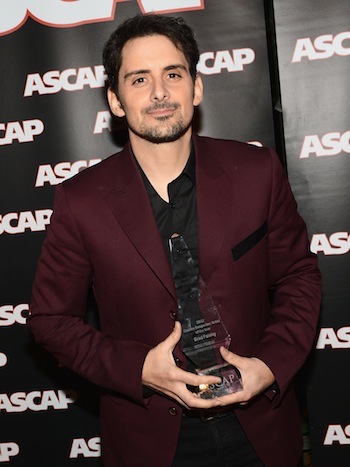 Brad Paisley wins ASCAP Country Songwriter/Artist of the Year. Georgia was on our mind at this year’s ASCAP Country Music Awards banquet. Songwriter of the Year Ben Hayslip, a native of the Peach State, returned to the stage again and again, either to accept an award or to sing. He performed “I Don’t Want This Night to End” with fellow Georgians The Peach Pickers, then returned to sing “Honey Bee” with Peach Picker Rhett Akins. The former song was a big hit for another Georgian, Luke Bryan. This was Hayslip’s second time to win ASCAP’s country songwriter prize. In addition, the Hayslip/Akins “Honey Bee” tied with “Barefoot Blue Jean Night” for ASCAP Country Song of the Year. “Barefoot” was penned by the organization’s Eric Paslay and Terry Sawchuk. Another repeating winner was Brad Paisley. Thursday’s CMA Awards co-host was named ASCAP’s Country Songwriter/Artist of the year for the third time. Sirius/XM Radio was ASCAP’s Partners in Music honoree. John Marks accepted and was joined onstage by Charlie Monk. Now that Sony/ATV and EMI are joined, is it any wonder that it was named Country Publisher of the Year? Does anyone else even stand a chance? In addition to the Haslip performances, the banquet was highlighted by the singing of ASCAP’s other top songs of the year. Paslay and Sawchuk drew a standing ovation when they were joined by a drum corps drawn from Vanderbilt’s marching band. Dave Barnes and Ed Cash performed their big hit “God Gave Me You.” Jason Sellers sang “Don’t You Wanna Stay” with his cowriters Andy Gibson and Paul Jenkins. 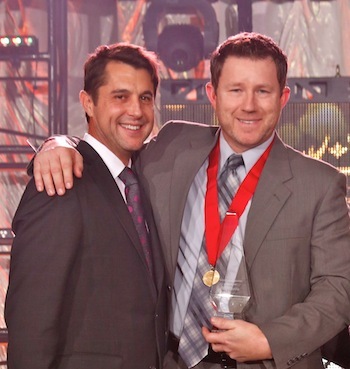 ASCAP Senior Creative Director Michael Martin with Songwriter of the Year Ben Hayslip. 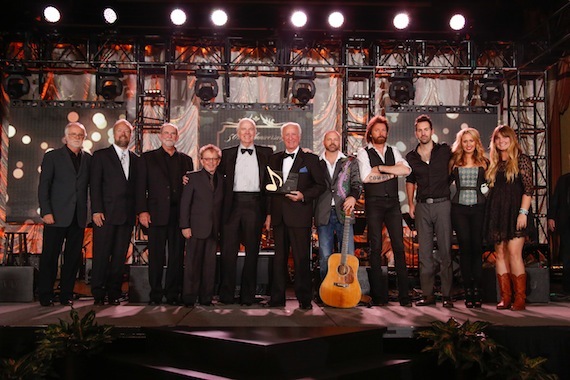 The most rocking performance of the night was the banquet’s opening number, Kip Moore’s explosive “Crazy One More Time.” Josh Kelley, Ronnie Dunn, Chris Stapleton and 18 South performed a multi-song tribute to Bob McDill, who won the ASCAP Golden Note Award. With 31 No. 1 hits to his credit, we could have heard a multi, multi, multi song salute to McDill. My favorite performance of the night was the Jon Randall and Sam Bush harmonizing duet on Lyle Lovett’s “If I Had a Boat.” That was part of a salute to Lovett as he was presented with ASCAP’s Creative Voice Award. Others who performed admirably during the tribute were Guy Clark and Robert Earl Keen. 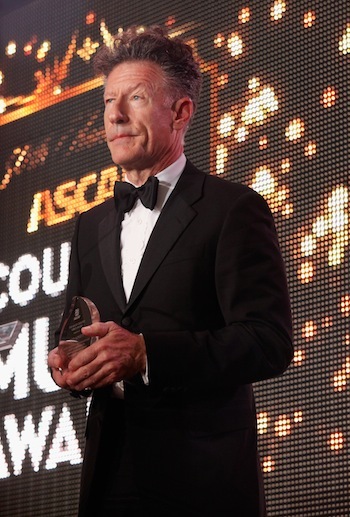 Lyle Lovett accepts ASCAP’s Creative Voice Award. The gala was staged at its traditional home, the Presidential Ballroom of the Gaylord Opryland Hotel on Monday evening (10/29). Attendees interpreted the “black tie/formal” invitation in a wide variety of ways. The ladies got out their velvets and sequins. The gentlemen’s outfits ranged from business suits to classy cowboy couture, from tuxedos to disrespectful work jackets and hoodies. Gathering together were Tim Nichols, Tim Mensy, Tim Wipperman, Mark D. Sanders, Mark Ford, Marc Beeson, Marc Driskill (who has departed from ASCAP for Sea Gayle), Mike Milom, Mike Reid, Mike Hollandsworth, David & Susana Ross, Dave Berg, David Lee Murphy, Brett James, Brett Jones, Rusty Jones, Jim Foglesong, Jimmy Harnen, Doug & Linda Edell Howard, Travis Howard, Bob Regan and Robert Ellis Orrall. Twinkling stars on hand in addition to Paisley and Lovett, included Deana Carter, Dierks Bentley, George Strait, new Opry member Darius Rucker, Martina McBride, RaeLynn from TV’s The Voice, Lady Antebellum’s Dave Hayward & Charles Kelley, Pistol Annie Angaleena Presley, and J.D. Souther, who has added acting to his resume via his appearances on TV’s Nashville. Guests dined on salad greens with cherry tomatoes, cucumber slices and slivered red onions topped with bacon and blue cheese crumbles and drizzled French dressing. The main course was glazed pork, shrimp, mashed potatoes and broccolini. Dessert was a trio of crème caramel in a shot glass, a fruit torte and a cream-cheese cookie. Table centerpieces were white and peach colored tea roses arranged with hydrangeas, roses and organza ribbons. The talent fest in attendance featured Pat Alger, Wayland Holyfield, Allen Reynolds, Rory Bourke, Fred Knobloch, Carl Jackson, Gary Nicholson, Rick & Janis Carnes, Vince Melamed, Liz Hengber, Chris DuBois, Josh Kear and Kelley Lovelace. Working the room were John McBride, Gilles Godard, Randy Wachtler, Carla Wallace, Norbert Nix, Kyle Lehning, Garth Fundis, Kevin Lamb, Ken Levitan, Shelby Kennedy, newly installed Warner-Chappell chief Ben Vaughn, Tom Long, Horton Frank, Dan Keen, Walter Campbell, Frank Liddell, Belmont University’s Bo Thomas, Dale Bobo, Ralph Murphy, Clay Myers, Brent Maher, Stuart Dill, Kay West, Tony Conway, Dwight Wiles & Diana Johnson, Judy Turner, Sherod Robertson and Scott & Sandi Borchetta. Scott was running on fumes, having spent the past week on international promotion for the new Taylor Swift disc and getting four hours of sleep a night. Sandi is creating Big Machine’s new office building on Music Row. This was the 50th anniversary of the ASCAP Country Awards, “a half century of honoring the best in country music,” noted ASCAP president Paul Williams. “For every song we honor tonight, I know you have 100 in a drawer somewhere. I know who you are.” Williams is a major songwriter, himself, with Grammy, Tony and Emmy awards to show for his efforts.